hits dealerships: 2020 for the u.s.
it's been a long time coming, but the end has finally begun for tesla's sole ownership of the luxury suv market. jaguar rolled out its impressive i-pace this summer, and it's due on sale this month. audi began production this week of its e-tron suv, which will have a delayed introduction in san francisco on sept. 17. bmw has an ix3 on the way. and in stockholm today, mercedes unveiled the production version of its eqc electric suv, which it immodestly bills as "the mercedes-benz of electric vehicles." the new suv also launches eq as an electric sub-brand for mercedes-benz. it says the line will grow to 10 eq electric vehicles by 2025, building on the new electric platform developed first for the eqc. in a design theme mercedes calls "progressive luxury," the eqc is very close to the generation eq concept unveiled at the 2016 paris motor show, minus some of the fanciful show-car details. it also has a strong family resemblance to the brand's latest gasoline models. this is overall a softer, less sculpted cousin of mercedes' glc-class suv, which comes in gasoline and plug-in hybrid variants. the front features a version of the brand's signature grille, but it's integrated with a big, winged unit along with swept-up adaptive led multibeam headlights. a standard led band across the top of the grille connects the headlights, and the grille's big three-point star lights up. a similar band connects the led taillights in a horizontal unit that gives the rear a decided resemblance to that of the 2019 lincoln nautilus. a single side character line sweeps up into the fender, continuing afterward in the rear bumper. like many other mercedes models, the eqc offers myriad styling options, including an amg exterior design package that adds a black-panel grille with twin chrome blades, a piano-black grille surround, a "jet-wing" front bumper design, a more aggressive rear bumper and wheels up to 21 inches in diameter; the standard wheels start at 19 inches. if you're a fan of the design and technology in mercedes-benz's current interiors, the eqc won't disappoint. the upholstery has quilted stitching, while rose-gold trim — an eq-specific detail — accents other areas. rose gold is currently a trendy jewelry finish, but it remains to be seen whether it will look dated in a few years. and, yes, as in other new mercedes models, a single glass panel dominates the dashboard, with unified twin 10.25-inch widescreens - one for the configurable instruments, the other for multimedia and control functions. the brand's well-designed mbux (mercedes-benz user experience) system powers the interface, which you can operate through the big center touchscreen, a center-console touchpad or thumbable steering-wheel touch buttons. alternately, you can use the natural-language voice control with learning capability by saying "hey, mercedes" and giving a command. the system, which includes standard navigation, also has smartphone integration and adds some ev-specific features, such as charging station locations and optimal ev route planning. mercedes says the voice control also has ev-specific commands, such as "how much farther can i drive?" for range and "i want the car ready at 8 a.m." for charging and preconditioning the cabin. the available range is continuously updated based on driving, road and traffic. 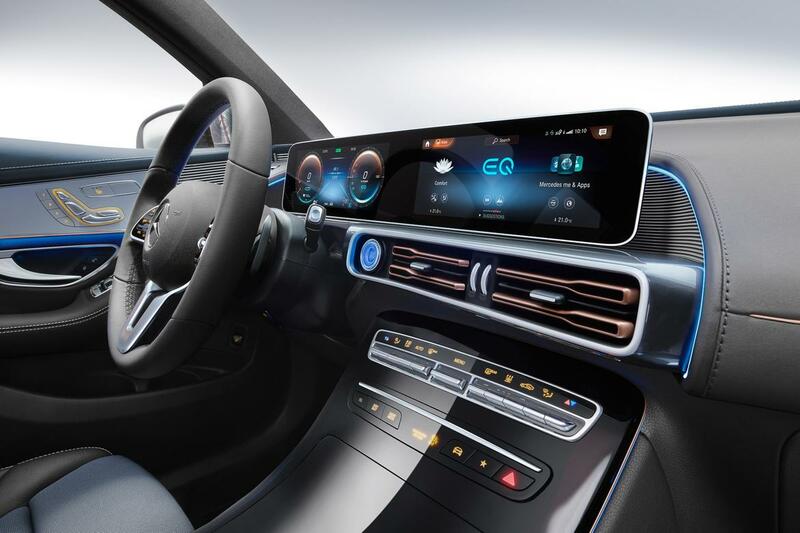 available interior features also include a head-up display and 64 colors of ambient lighting in nine color schemes, plus an eq-specific mode that shows the car is charging with a pulsing green color. you also can pamper yourself with the brand's energizing comfort package, which combines seven preconfigured programs with music, scented airflow and seat massage to enhance specific moods, such as stress relief or energy. the eqc even adds its own program for "relaxation and energy" while you're parked and charging the battery. the eqc's drive system uses an electric motor on each axle for all-wheel-drive capability with a combined 402 horsepower and a massive 564 pounds-feet of maximum torque. given the instant torque of electric drive, we'll be eager to give that a try. mercedes says it tuned the drivetrain so the front motor offers the most electric efficiency at low to medium loads, while the rear motor adds a sportier feel during aggressive driving. zero-to-60 mph performance is an estimated 4.9 seconds. the under-floor battery has 80 kilowatt hours of capacity with an all-weather temperature control system. mercedes estimates it should be good for 200 miles of range, slightly short of the jaguar i-pace's estimated (but not yet epa-verified) range of up to 240 miles on its bigger 90-kilowatt-hour battery and the tesla model x's epa-rated range of 238 (75d) to 295 (100d) miles. with a lower estimated range on a larger battery versus the model x 75d (75 kilowatt hours), the eqc does not achieve tesla's energy efficiency of 36 kilowatt hours per 100 miles. the eqc comes standard with dc fast-charging capability, which can achieve up to an 80 percent charge in 40 minutes. selectable driving modes allow you to prioritize use of the battery charge. settings include a default comfort mode for normal driving, a high-efficiency eco mode, a max range mode that squeezes the most possible range from the battery with anticipated road and traffic conditions ahead, a sport mode for more spirited driving and an individual mode that lets the driver set individual characteristics separately. in eco mode, feedback from the accelerator pedal also will prompt the driver for increased efficiency. steering wheel controls allow you to adjust the aggressiveness of energy recuperation by the regenerative brake system. settings range from an automatic setting to a maximum-regen setting that offers one-pedal driving in most situations — something various other electric cars also offer. in our experience, that's a feature urban drivers with a lot of stop-and-go driving or stop signs at every corner can really appreciate. the eqc has standard forward collision warning with automatic emergency braking and pedestrian and bicycle detection. optional is the latest generation of the brand's more sophisticated safety and driver assistance technology. that includes predictive speed adjustment that can look ahead for traffic jams you might not see yet, slowing the car and then resuming speed when the way is clear. the package also includes route-based adaptive cruise control with stop-and-go capability, lane-centering steering up to 80 mph with evasive assistance, and a blind spot warning with a passenger exit warning for approaching vehicles.